Delighted to say Dorset Life magazine will be publishing an article of mine in January 2019, entitled 'The Chart House, Mudeford'. It's about how a local Dorset couple restored a former coastguard officer's property to its near original Victorian state. Made a refreshing change for me to write about something other than running or food and drink - and thoroughly enjoyed the opportunity to spend time in such a beautiful home with a very interesting couple. Delighted to say my most recent book 'The Man Inside The Machine' - a biography about Steve Edwards, one of the world's most successful multi-marathon runners ever - has been nominated for The Running Awards 2018 (book category). To vote go to: http://therunningawards.com/vote/205#vote. Voting closes 29th November 2017. Thank you! 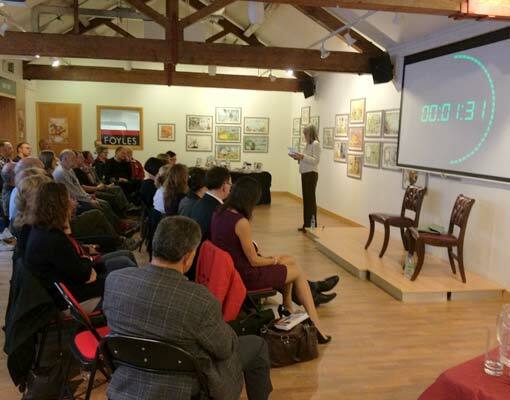 Launch of 'The Man Inside The Machine' - the official biography of Steve Edwards, one of the world's most successful multi-marathon runners - 700 official marathons - average finish time 3 hrs 16 mins, takes place at the Taunton Marathon. Re-launch of Mental! as a compact paperback with exciting new cover and title: Are You Tough Enough? A friend indeed - Terry Porter promotes Running Crazy book at the 2015 London Marathon. Mental makes it into the window of Helen's local book store, Bookends of Christchurch. 3 July 2014 - My second book, ' MENTAL!' is due out on 3 July 2014. The late legendary cross-country supremo and good friend, Gerry North, at the Brighton Marathon expo 2013. 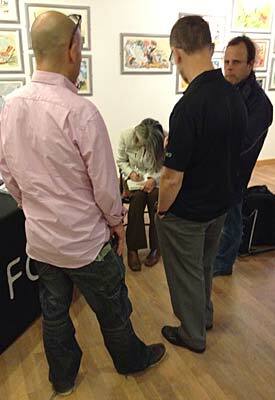 Looking forward to a return book-signing visit at the New Forest Marathon on Sunday, 22nd September 2013. A third interview with Radio Solent is set for Tuesday, 6th August, around 1.30 pm on the Katie Martin Show. Radio Solent are dedicating August to fitness and exercise following the recent Anniversary Games and I will be talking about some of the people in my book, returning to exercise after a lay-off and also my next book, 'Toughest, Bloodiest, Hardest Challenges in the World', due out in 2014! Delighted to discover in the August edition of Writing Magazine that I was runner-up in their 'Race Short Story' competition. My story, entitled 'Ghost Running', can be read at www.writers-online.co.uk. Further exciting news that my first book, 'Running Crazy', is being released in the States in September 2013! Running Crazy was re-released as a smaller paperback on 1st April 2013 and is available through this website, from Amazon and all good bookshops - RRP: £7.99. 29th May 2013 - Talk and book signing at Bournemouth Festival of Words - Castlepoint Library, Castle Lane, Bournemouth - 3-4 pm. 7th May 2013 - Interview on HOT Radio, the Geoff Carter Show - more chat about the book and where to buy it - with special mention of Bookends, Christchurch, where I work two days a week and am available to sign copies of my book. 2nd May 2013 - Interview on BBC Radio Solent Katie Martin Show - talking about the re-release of Running Crazy as a smaller paperback edition and the Bournemouth Festival of Words. At the Portsmouth Book Fest - with fellow writer, Adharanand Finn. A great time was had by all! Saturday, 27th October 2012 - I will be appearing at the Portsmouth Book Fest at 2 pm; talking, reading and answering questions for an hour, followed by a book signing session. 21 August 2012 - My first non-fiction short story entitled Ordinary - A True Fairy Tale, has been published and is available as a download to I-phones for just 69 pence NOW at www.etherbooks.com. My book launch held at Foyles book shop, London, Thursday, 10th May. Friday, 13th & Saturday 14th April 2012 - I will be at the Brighton Marathon Expo on the 'Running Crazy' stand with my book, signing copies and chatting! Monday, 2nd April 2012 - The Daily Express published an extract from 'Running Crazy'. On the 12th January 2012, I was invited by David Phillips, one of the runners featured in my book, ‘Running Crazy' to attend the Daily/Sunday Telegraph Brain & Spine Foundation London Marathon Launch held at Arsenal Football Club. The Telegraph sponsors a team every year to run in the London Marathon and raise funds for the Brain & Spine Foundation and David has run for the Team for the past 11 years. Through that and other marathons run all over the world, David has raised over £50,000 for charity, predominantly the Brain & Spine Foundation. Also present at the event was boxer, Michael Watson, who suffered severe head injuries in his final fight and was treated by the UK's leading neurosurgeon and founder of the B&SF, Peter Hamlyn. Not expected to walk again or regain full speech, Michael has defied all the odds and has acted as honorary captain to the Telegraph Team on several occasions, once walking the entire marathon course over six days himself. Of his accident, Michael said that it had enriched his life because it has allowed him to help others in a way he never could have done before. Now it is I who am speechless. 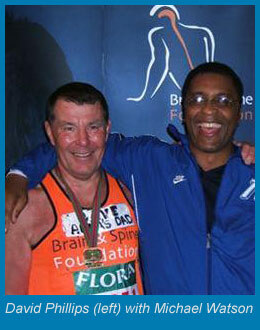 For further information about the Brain & Spine Foundation, please visit their website at www.brainandspine.org.uk.